In 2006, at the end of his first term on the Supreme Court, Roberts told me in an interview that the most-successful chief justices were able to persuade their colleagues to put the interests of the Court as an institution above their own ideological agenda. As it happened, like Barack Obama—another Harvard-educated prodigy who came to Washington pledging to be a uniter, not a divider—Roberts had a harder time overcoming the partisan divisions than he had initially hoped: he presided over a series of split decisions pitting the five Republican justices against the four Democratic justices in cases involving partial-birth abortion, gender discrimination in the workplace, gun rights, and, most explosively of all, campaign-finance reform. But this year, when it came to handing down the most important decision of his young tenure, Roberts did precisely what he had promised: he put the institutional legitimacy of the Court above his own ideological agenda and cast a tie-breaking vote with the liberal justices to uphold the Affordable Care Act. 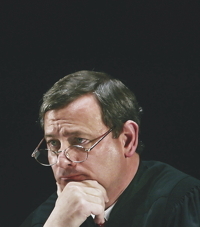 Roberts’s choice was brave because he knew how dramatically his decision would infuriate his conservative colleagues. The chief justice ignored the prospect of disappointing either the left or the right and made a decision of which his hero, Marshall, would have been proud. Engaging in what Marshall’s archrival, Thomas Jefferson, called a “twistification,” Roberts joined the conservatives in rejecting the mandate’s legality according to Congress’s power to regulate interstate commerce, but joined the liberals in upholding the mandate as an expression of Congress’s power to levy taxes. To avoid a confrontation with the president, Roberts, like Marshall, was willing to sublimate his policy views into his long-term goal of maintaining the Court’s legitimacy. With a decision that managed to be both brave and shrewd, Roberts finally made the Court his own.